The Bullies | American McCarver. Your Sports Blog. The bullies were in town last night. And, like all bullies, they took a perverse, unthinking pleasure in pounding the unholy crap out of anybody and anything they could get their meaty, lummox hands on: the Dodgers, the Dodgers’ fans, and — saddest of all — the innocence of childhood. But that’s what bullies do. But, of course, real life doesn’t work that way. In real life, the bullies win and the weaklings are beaten senseless. The Phillies took the lead away, run after run after run. They scored at will, cycling through Dodger pitchers like so many bookish 98-pounders. The Dodger bullpen gate saw more people pass through it than the stadium entrance. They even thought it would be funny to put their palm on the Dodgers’ forehead in the bottom of the ninth, laughing as the Dodgers took one last flailing shot at a win. OK, fine. It’s a game, and you play games to win. I’ve had my heart broken by more important things than baseball. But it’s not me I’m concerned about. It’s the children. My son was at the game yesterday, with his day-camp. 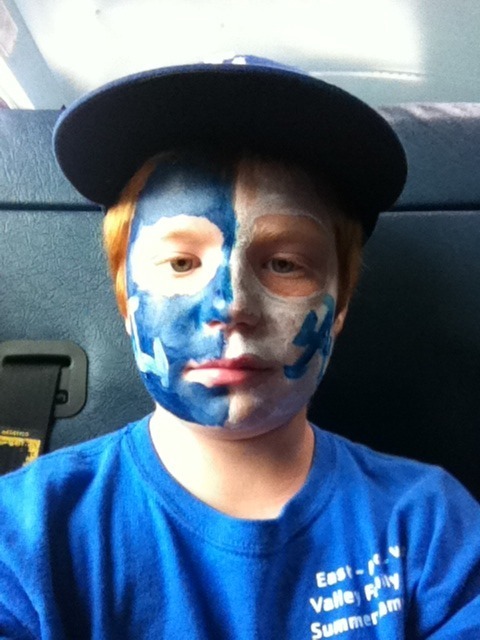 He’s wanted to paint his face ever since he got interested in sports and began steady exposure to beer commercials. Because I consider face painting the sort of thing that people from Philadelphia do, I’ve adamantly refused. But yesterday, without me, he finally got the chance. He was thrilled. This was the thing that was going to make a difference. This was the magic that would turn the season around. My boy is too young to know real loss. I know I can’t protect him forever, but he’s twelve and so he’s never had a woman walk out, or a job dead-end, or something he’s proud of be savaged by thugs and philistines. He’s a boy, still with hopes and dreams. Last night, a part of that boy died, sacrificed at alter of the bullies. They took a wonderful moment of his childhood — a glorious moment of vindication and validation — and knocked it to the ground, laughing as they did. The message is clear. There can be no doubt. It’s communicated as powerfully as a punch to the gut that drops you to your knees, unable to breathe.